How Do Large Companies Communicate Internally? Every organization, large and small, needs great internal communication in order for it to function effectively. Employees need to have the information they need to do their jobs well, and should also have tools at their disposal to communicate effectively with management and their colleagues. If you are working in a large organization, it can be especially challenging to deliver internal communication campaigns and ensure you reach everyone. When you have hundreds, if not thousands of employees, what works well in a small business with one office location is not necessarily going to work for a multinational with offices all over the world. Trying to communicate to thousands of people without a clear strategy is like flying blind. You need clearly set out goals of who you are going to communicate to, when you are going to communicate, what you are going to say, how often you are going to deliver your key messages, who will deliver the communications campaign and what channels are going to be deployed to get your messages out there. You also need to have actions that you can measure on your strategy – if you have no measurement tools in place you can’t be clear if your strategy is working. Large organizations are more likely to have teams with members across different offices or time zones – or even have remote workers – who need to collaborate on projects and communicate effectively in order to do so. These organizations are ensuring their people have access to project management tools. Messaging apps, better document sharing functions and encouraging more use of video conferencing. Email is one of the biggest productivity killers in the modern workplace. Around 23 per cent of an employee’s time can be spent dealing with them. But we receive so many every single day that not all of them are even opened or read. This is, of course, a disaster for internal communications – how much important information is missed as a result of digital clutter? Some large organizations, like the French information technology company Atos, have enforced “zero internal email” policies and opted for other solutions instead. Employees in that company who were previously suffering from email overload received 64 per cent less emails in their inboxes. According to statistics from International Data Corp, Fortune 500 companies lose around $31.5 billion every year through a failure to share knowledge effectively. These businesses are investing into knowledge management systems and encouraging their employees to use face-to-face communication more to share information. Sometimes you can’t beat the good old office water cooler! It might sound surprising in 2018 that not every business does everything on computers. Large, bureaucratic organizations can still drag the chain and insist on doing many functions using paper-based systems for a variety of reasons – from not being agile and willing to change, or because they think if it isn’t broke why fix it and sink money into new tech systems. If your important company information for employees is paper based – such as policies, procedures and handbooks – it’s not as easy to find and share as it would be if you adopted digital solutions. Recent research from McKinsey found that many long-established companies lose as much as half their annual revenue and one third of their earnings growth to competitors who embrace digital technology. Linking in with using less emails, going digital and sharing and collaborating with peers has been the rise of corporate social networking platforms. These work just like traditional social media, but are used so employees within an organization can share information with colleagues. Tools include Facebook Workplace, Yammer, Slack and SharePoint news feed. Savvy organizations ensure they keep the same look and feel whether they are talking to employees or communicating with external stakeholders – all communication, whether internally or externally, is part of your organization’s story. Employees, of course, should always hear big news first before it is released to the general public. It can be quite demoralizing to hear about something important second-hand or through the media. Not only is video conferencing a better option than emails or traveling to meetings over vast differences, it can also help to deliver internal communications campaigns. Hosting webinars, for example, where employees can all attend and hear the same information from the same person at the same time is a brilliant way to ensure consistency in messaging and information sharing across the organization. Using video to record events and make them accessible is another way to improve information sharing. The world’s largest hedge fund, Bridgewater Associates, records every meeting that’s held and makes it available to all employees. Not only is this a great internal communications tool, but it can be used as a learning and development tool and it keeps meetings more transparent and accountable. If traditional communication methods just aren’t cutting through, it’s important to think outside the box and try something new. 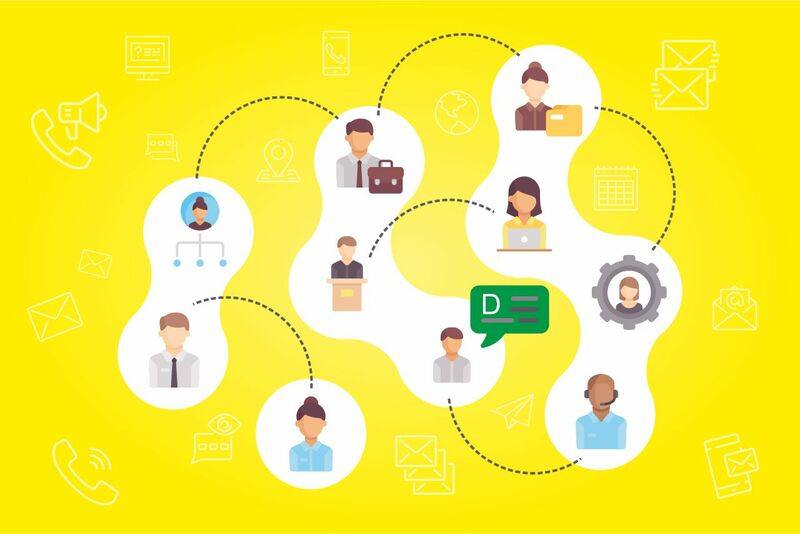 Looking for and investing in new internal communication solutions helps large organizations stay agile and ensures that their employees know about important issues. Companies House is a British government organization that handles business registration across the whole United Kingdom. The organization needed a reliable way of delivering information to staff based in four regional offices. 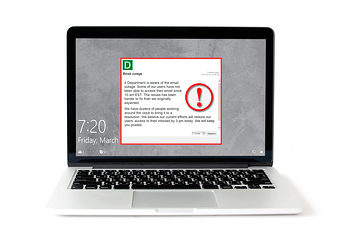 They invested in DeskAlerts, a powerful software solution that delivers internal communications to employees via pop-up notifications on their computer screens, bypassing traditional information channels such as email.